Simplicity is my new motto for memory keeping. With so many photos to document, it really is the only way that I will get them into albums for us to enjoy. 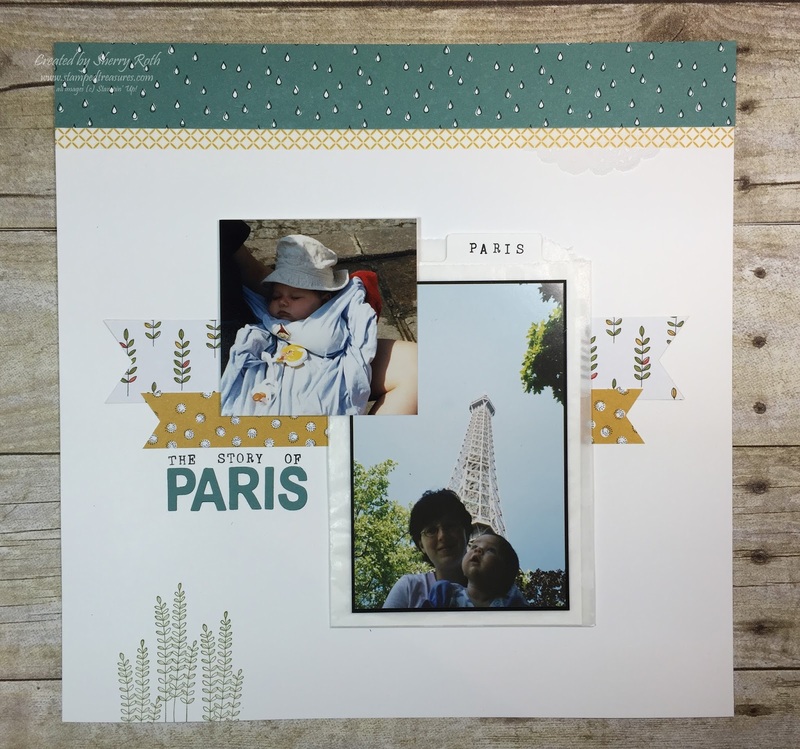 Project Life has been a life saver but I still like to do traditional scrapbooking as well so I combine both in my albums. 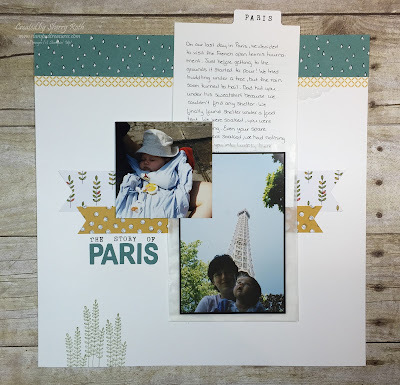 Today's layout tells the story of our trip to Paris when my daughter was only a couple months old. The photos aren't the best but they tell the story. At the time my parents were living in Germany so when I was on mat leave, Marcel took a month off and we went to visit them. While there we decided to take a bus trip to Paris (just the three of us). Paris is one of my all time favorite places I've ever been (I had already been there twice) and I really wanted to share it with Marcel. He is a huge tennis fan and while we were there the French Open was on so we decided to go check it out. We were walking towards the venue and it started to pour! We were in the middle of a residential area with no where to go. Marcel put Jordyn under his shirt to protect her and we ran. Eventually we found a food tent but not before EVERYTHING we had with us was soaked! Jordyn was cold and wet and we had nothing dry to change her into. There happen to be a couple in the tent that noticed our situation, gave us a towel to dry off with and a dry t-shirt for Jordyn. It was HUGE on her but at least it was dry. I still have that t-shirt in her baby box. So grateful for this stranger coming to our rescue. The paper and stamps I used are both from the Sale-a-Bration brochure - free with a $60 purchase. Nothing special about the layout except that the story is documented and in Jordyn's baby album for it to be remembered, which is really what it's all about! Click on any of the items to find out more information, pricing or to place an order.